James Onanefe Ibori, former governor of Nigeria’s oil rich Delta state, has been sentenced to thirteen years in jail by a London Judge for stealing government funds in Nigeria. The sentence brings to an end the ex-governor’s long road to jail and earns him the repute of the first Nigerian politician to get a jail sentence abroad for stealing [public funds – an act which has become an open pass-time for Nigerian politicians. This is the third time Mr Ibori, a serial thief, got sentenced for theft in London. Mr Ibori gets the latest sentence for stealing at least $250 million of public funds within the period he served as governor of the wealthy Delta state. After listening to the prosecutor reel out Mr. Ibori’s crimes, his counsel, Nicholas Purnell, apparently to Ibori’s astonishment, entered a plea strategy – begging the judge to be lenient with his client’s punishment. Mr Purnell cited Ibori’s accomplishments while serving as governor of the state he admitted looting. Ibori’s lawyer credited him for every development in Nigeria, from banking reforms, peace in the Niger Delta to improved bilateral relations between the UK and Nigeria. Like the prosecutor, Mr Purnell admitted Mr. Ibori stole money from his people in the V-Mobile shares deal he brokered with the Akwa Ibom state government but blamed the then Akwa Ibom state governor, Victor Attah, and Ibori’s former lawyer – and conduit for the stolen wealth – Bhaderesh Gohil, for luring him into the crime. John Fashanu, ex-footballer and a close pal of Ibori, was also in court and testified to Ibori’s goodness in character and sports development. Mr. Ibori is the last of his friends and family to be jailed for his thefts as governor of the oil-rich Delta state. His wife, sister and mistress have been convicted of money-laundering in the UK and are serving various terms in prisons. His solicitor, Gohil, was also jailed for 10 years for helping syphon the money Mr. Ibori stole. In addition to the prison terms, the Judge said Ibori’s sentencing is not the end of matter as his property will be confiscated and consequences may arise thereafter. 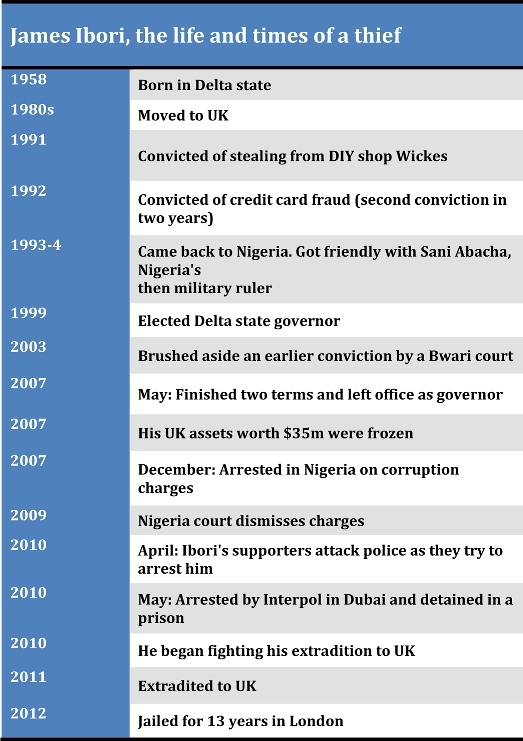 In 2007, a UK court froze assets allegedly belonging to him worth $35m after he failed to justify buying the property with his annual salary as Delta state governor of less than $25,000. Both the prosecutors and Ibori’s counsel admitted before the judge that he collaborated with a former governor in Nigeria, Victor Attah, the then governor of Akwa Ibom state. The lawyers told the judge repeatedly that the two former governors formed a phantom company called ADF to siphon US$37.5million from Delta and Akwa Ibom states’ shares in V-Mobile – a Nigerian telecom company. While Ibori’s former solicitor, Gohil, was jailed for 10 years for helping syphon the money Ibori stole, Nigerian officials said they have no case against Mr Attah, raising concerns about Nigeria’s ability punish corrupt politicians. “We have no case against him – Victor Attah,” Wilson Uwujaren, Economic and Financial Crimes Commission spokesman said. He said the commission “will wait for the court ruling first,” before considering drawing up charges against him. “That is almost impossible in Nigeria with its anti-corruption agencies, EFCC and ICPC,” Wilson Attah, a lawyer in Abuja said. Lucky Igbenedion, former governor of Edo state is the first Nigerian ex-governor convicted of looting public funds. The EFCC charged him with 142 counts of corruption amounting to $24 million (£12m) using front companies. Lucky entered a plea bargain with the commission in 2008 and refunded a fraction of the amount he was said to have embezzled – and went home. None of his ex-governors mate, with similar charges got to that point again in a Nigerian court. Read our live updates of the sentencing below. Preview live updates from the court room here.